Warning: At the very least, read The Hidden Oracle, book one in The Trials of Apollo, before proceeding. If you really want to catch up, though, read all the books in the Percy Jackson and the Olympians and The Heroes of Olympus series as well. I finished reading The Dark Prophecy, the second book in Rick Riordan’s The Trials of Apollo series, on Monday. I had every intention of writing up a post on it that day. As you’ve noticed, that didn’t work out. Thanks to after school meetings, household chores, season finales of my favorite shows, and general end-of-school-year stress, I didn’t have the time or energy to focus on a blog post. Probably a lame excuse to some, but that’s all I’ve got. At any rate, I’m here now, and I want to briefly discuss The Dark Prophecy. I’ll try to steer clear of too many spoilers, but that may be unavoidable. We’ll see how it goes. When last we left Apollo, now known as Lester Papadopoulous, he had just been through the wringer at good ol’ Camp Half-Blood. He managed to save the one of his oracles, the Grove of Dodona, but he is no closer to regaining his godly status. Meg McCaffrey, the demigod who controls Apollo’s fate, seemingly betrayed him to her evil jerk of a stepfather, Nero (known affectionately as “the Beast”). 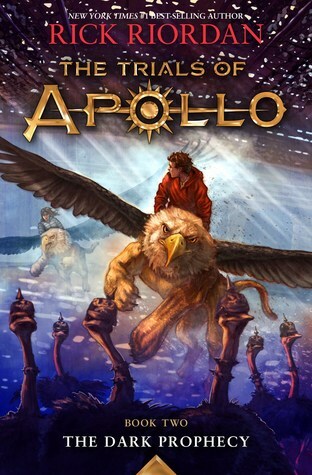 Apollo also had to fight the Colossus Neronis, who nearly destroyed Camp Half-Blood. Now, with the help of Leo Valdez and Calypso, recently returned from their island exile on Ogygia, Apollo has to rescue yet another oracle before Nero and company take over the world. The next oracle to be saved, the Oracle of Trophonius, is in Indianapolis. When Apollo, Leo, and Calypso arrive in Indianapolis, they discover more than just another bad guy trying to take over the world. They find a place of refuge, some blasts from the past, and people (and other assorted beings) willing to either kill them or provide a bit of help. Sometimes, it’s difficult to tell which is which. In addition to Leo and Calypso, Apollo is joined by the guardians of the Waystation, a haven with what seems to be its own consciousness. He also reunites with Meg McCaffrey. Apollo doesn’t know if he can totally trust her, but his fate is tied to her, so he doesn’t have a whole lot of choice. There’s also the Hunters of Artemis, some rescued demigods, a snake-lady, a couple of griffins, and an elephant named Olivia. With all of this awesome assistance, saving the Oracle of Trophonius should be easy-peasy, right? Yeah…not so much. If you loved The Hidden Oracle, you’ll likely feel the same way about The Dark Prophecy. Even with all the darkness facing Apollo and friends, they react with the same humor and snark that we’ve come to know and love. And although Apollo is often his somewhat narcissistic self, he’s reflecting on his past and dealing with the many mistakes he made. He may not want to be mortal, but he is coming to terms with his own humanity and the impact he’s had on others. Going back to the humor Rick Riordan is known for, let’s not forget the extremely entertaining haiku peppered throughout this book. Once more, each chapter begins with its own haiku foreshadowing what’s about to happen, which is way more fun than simple chapter titles. I look forward to seeing more of this in the next books. Speaking of the next books, there will be three more volumes in The Trials of Apollo. Book three, The Burning Maze, is set to be released on May 1st, 2018, and I’m fairly certain we’ll see some of our friends from Camp Jupiter in this one. Not to mention a certain satyr companion that needs no introduction. While we wait impatiently on the next book, take a peek at Rick Riordan’s website. Also, if you haven’t already, read the first two books in his Magnus Chase series. The third book, The Ship of the Dead, comes out on October 3rd. If you haven’t read the following books in the Lorien Legacies (I Am Number Four) series, go no further. You will be all kinds of lost if you haven’t read the entire series up to this point. So…I guess it’s fairly obvious that I’ve been catching up on the Lorien Legacies series. The series as a whole is now complete, but I had to read the last collection of novellas before moving on to the seventh and final full-length novel, United As One. I’m hoping to conclude this series sometime in January, but let’s turn our attention to Zero Hour for now. Zero Hour, like the collections before it, is comprised of three novellas that provide a little more insight into the Loric Garde, their allies, and the Mogadorians that seek to take over Earth. In this particular collection, we see things from the perspectives of several characters we’ve met before–some friendly, others not so much. The first story in Zero Hour is Legacies Reborn, and readers are reintroduced to a character we met in The Fate of Ten. Dani Morales is a girl living in New York City. Her biggest concern is dealing with her horrible stepdad…until she realizes that aliens have invaded her city and seem determined to wipe out all traces of resistance. Separated from her mom, Dani tries to get across the city and reunite with the only person that really matters to her. She soon learns that this task won’t be easy, but she may get some help from some allies…and from some newfound powers of her own. Next up, we have Last Defense. In this story, we learn a bit more about Malcolm Goode, otherwise known as Sam’s dad. Malcolm is still dealing with being held captive by the Mogadorians for years, reuniting with his son, and doing whatever he can to help in fighting this alien invasion. Malcolm has information that very few people on Earth are privy to, and that inside look at how the Mogadorians operate makes him valuable to those looking to combat this threat, particularly the President and his closest advisers. But how does Malcolm reconcile assisting the President with his need to keep his son safe? Finally, there’s Hunt for the Garde. This novella is actually three stories in one, all from the perspectives of Mogadorians (or bad guys). First, we hear from Phiri Dun-Ra, a loyal Mog officer who has messed up in the past and is looking to make up for it in the eyes of the Beloved Leader, Setrákus Ra. She now has her chance. Second, we see Vintaro Üshaba, another loyal Mog who delights in war, inflicting pain, and furthering Mog Progress. Vintaro is merciless, and he will do whatever is necessary to bring in anyone believed to be a threat to Setrákus Ra’s plans. He thinks little of his targets, and that may be his ultimate undoing. Third, we are reintroduced to Rexicus Saturnus. This young Mog, who grew up on Earth and once helped Adam escape from a Mog stronghold, is having doubts about everything happening around him. (Note: Read the other books if you don’t know who Adam is. He’s pretty important.) Maybe Adam was right about everything, including fighting against the Mogadorians. Maybe Setrákus Ra isn’t as all-powerful as he claims. Rex isn’t sure which way to turn, but he’ll have to decide which side he’s on very soon. So, that’s Zero Hour. It definitely whets my appetite for United As One, and it hints that things are going to get much worse before they get better. I guess we’ll just have to see. At the very least, it should be interesting to see how the characters and storylines from Zero Hour play into the final chapter of this exciting series. 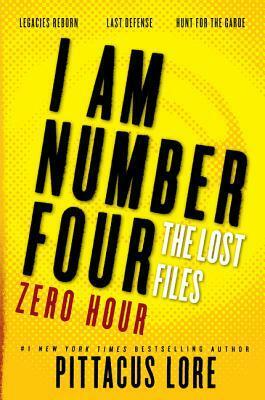 For much more information on the Lorien Legacies series, go to the I Am Number Four Fans website. Enjoy, and I’ll be back for my 2016 wrap-up in a couple of days. It might be a good idea to read The Sword of Summer and Hotel Valhalla: Guide to the Norse Worlds before proceeding with this post. At the very least, it is absolutely necessary to read The Sword of Summer prior to starting The Hammer of Thor. You’ll be all kinds of lost if you don’t. 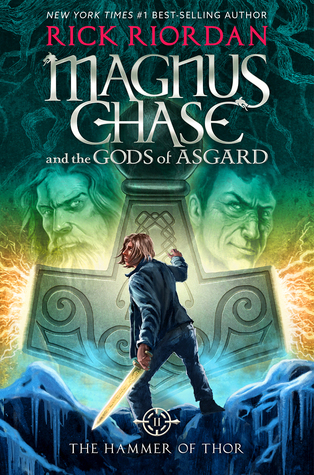 Last night, I skipped all of my shows so that I could finish reading The Hammer of Thor, book two of Magnus Chase and the Gods of Asgard by Rick Riordan. If you follow this blog at all, you’ve probably figured out that I really dig anything Riordan cares to write, and this book didn’t change that at all. If anything, I love this writer even more because of his inclusion of diverse characters in his books–this book in particular. Add in loads of action, suspense, humor, and sarcasm, and I’m completely sold. Many of my students are with me on that. As Magnus, Samirah, Blitzen, Hearth, and newcomer Alex try to find Thor’s hammer and avoid war and/or Ragnarok, they will face family difficulties, Norse zombies, a super-dangerous sword, a rigged bowling competition against giants, and–worst of all–a wedding. As if that’s not enough, in their quest to find Mjolnir, they may just play into their worst enemy’s hands. As you’ve likely surmised, I’ve left out a crap ton of details. That is intentional. 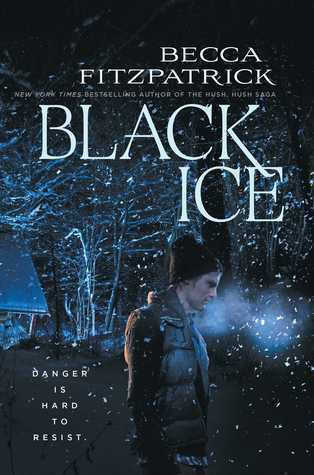 Like all of Riordan’s books, you really need to experience this one for yourself. The cover alone, though, makes it pretty obvious that a lot of the conflict in this book involves Loki. (This version is not to be confused with the Marvel “villain” played by Tom Hiddleston.) He’s a wily one, and his hand is in most of what happens in this book–including totally failing at being Parent of the Year. We’ll just have to wait and see if things work out for him in the end. If you can’t wait nearly a year for the next Riordan book, you’re in luck! The second book in The Trials of Apollo series, The Dark Prophecy, will be out in May. (Still a long wait, I know.) If you haven’t read book one, The Hidden Oracle, you’ve got plenty of time. For more information on The Hammer of Thor and all of Riordan’s other fantastic books, visit the author’s website. You can also connect with him on Twitter, Tumblr, Blogspot, and Facebook. Finally, check out the official trailer for the Magnus Chase series. It doesn’t give away much (and the narrator’s accent is a little weird to my Southern ears), but it’s worth a watch or two. Spoiler alert! If you haven’t read Black Widow: Forever Red, turn back now. I promise this post will spoil parts of this first book (and possibly the second) for you. This will be your only warning. As you’ve no doubt gathered, I recently finished reading the sequel to Black Widow: Forever Red by Margaret Stohl. The second book, Red Vengeance, will be released to the masses next Tuesday, October 11th, though I have seen it in stores already. I got to read the book a little early thanks to NetGalley, and I thought it was wonderful. It was action-packed, convoluted at times, horrifying, and entertaining. Like the first book, I loved seeing some of my favorite Marvel heroes–aside from Black Widow–in a different light. If you enjoyed the first book, Black Widow comic books, or her appearance in the Marvel Cinematic Universe, I think you’ll definitely appreciate getting a closer look at this enigmatic character in Red Vengeance. 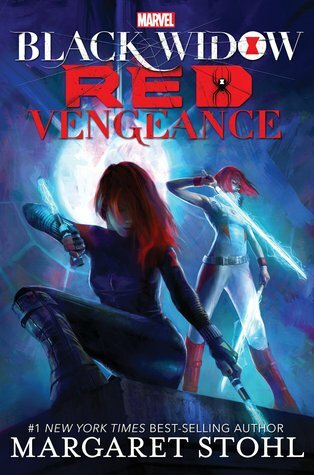 Red Vengeance picks up several months after the events of Forever Red, and it once again focuses primarily on Natasha Romanoff (aka Black Widow) and Ava Orlova (Red Widow). Both are still reeling after the death of Alexei, Natasha’s brother and Ava’s first love. Ava is training with Natasha, trying to learn to use and control her new powers. Natasha is attempting to come to grips with everything that has happened and find some way to regain her confidence in her instincts. Soon enough, both Widows will have to put all of their training and instincts to use to face threats both old and new. While following a tip about Red Room activity in Brazil, Natasha and Ava come into contact with a girl in a green dress. After that initial contact–a stellar brush pass–everything begins to go haywire. Someone manages to hack and erase all of Natasha’s secure files. Who could possibly have the ability to do such a thing, and why would they target the Black Widow? Natasha and Ava attempt to escape to safety only to have Natasha’s Widow’s Cuff–and her motorcycle–blow up. They seek refuge in one of Tony Stark’s many homes, and they call in SHIELD to help figure out what’s going on. They confer with Phil Coulson, Maria Hill, Tony Stark (Iron Man), and Carol Danvers (Captain Marvel) to see who could possibly have pulled off such a genius hack. Nobody really knows, but it’s clear that something serious is afoot. Red Room serious. Natasha knows that Ivan Somodorov is dead, but it seems that someone else is trying to continue his evil work. Someone who has it in for Natasha and her rather explosive apprentice, Ava. The two Widows follow the clues into the Amazon where they discover something truly appalling. Not only is the Red Room’s work continuing, but whoever is running the show has five nuclear missiles at their disposal as well as a terrifying new drug called Faith. Natasha and Ava do what they can to minimize damage, but even the Widows can’t totally stop the catastrophe that’s coming. Someone–a person with a connection to Natasha’s past–has their own agenda and will do whatever it takes to see it come to fruition. Does that mean deploying nuclear missiles? Does it involve distributing a gruesome, mind-altering drug? (The answer to both questions is a resounding “YES.”) How can Natasha, Ava, and their assorted friends possibly eliminate such a threat? And what if this is only the beginning of what’s in store for the Widows? I probably should have stopped writing a few paragraphs ago. I feel like I’ve given way too much away. Let’s just be grateful I called a halt when I did. I could seriously go on and on about this book and its predecessor. Black Widow is one of my favorite Marvel heroes, and I adore both of these books. I also really appreciated the appearance of Captain Marvel in this story. She’s another favorite, and I loved that both she and Black Widow were part of a “Women of Power” poker night. Oh, to be a fly on the wall. 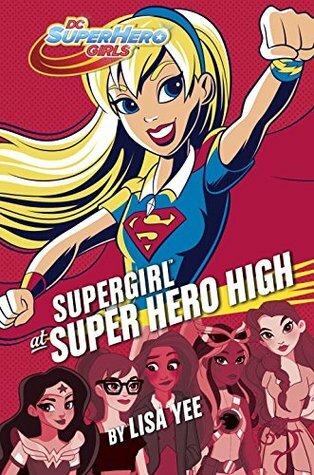 From what I understand, there’s a possible Captain Marvel novel in the works, written by Shannon and Dean Hale, but I don’t have any details on a possible release date. Speaking of future Marvel books, given the way that Red Vengeance ended, we can be sure that at least one more Black Widow novel is on the horizon. Unfortunately, there’s no word yet on when we can expect the next story. Bummer. For more information on Red Vengeance and other books by Margaret Stohl, visit the author’s website and Twitter page. These are probably the first places you’ll find an announcement on book three. Given that book two hasn’t been officially released yet, though, you could be in for a long wait. Be sure to pick up Black Widow: Red Vengeance on October 11th! A word of warning: Proceed with caution if you haven’t read both The Iron Trial and The Copper Gauntlet, the first two books in the Magisterium series by Holly Black and Cassandra Clare. This post might be a little spoilery if you’re not totally caught up. This may not be my standard post. I’ve been awake since 3am, and I’m having a little trouble keeping my eyes open, much less stringing sentences together. I’ll do the best I can. 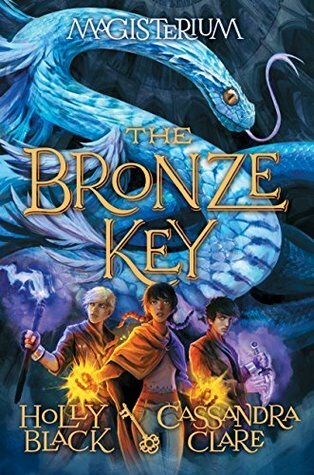 Yesterday, I finished reading The Bronze Key, book three in the Magisterium series by Holly Black and Cassandra Clare. This book continues the story of Call, Aaron, and Tamara, three young mages trying to figure out this whole magic thing. They are students at the Magisterium, and Call and Aaron are both Makars, or mages with an affinity for chaos magic. As The Bronze Key begins, Call, Aaron, Tamara, and their frenemy Jasper are being honored for their action against Constantine Madden, known as the Enemy of Death, and his minions. What most people don’t know is that the soul of the Enemy of Death is very much alive…and residing within Call. Call worries that he’ll become an evil overlord one day, but that’s only part of his problem at the moment. At the party honoring Call and his friends, one of the Magisterium students is mysteriously killed and another attempt is made on Call’s life. It’s clear that someone is out to get him, but why? Does someone know his secret, or has he outlived his usefulness as a Makar? Soon enough, Call and company are back at the Magisterium, and the mystery deepens. There is a spy in their midst, and it could be anyone. Call doesn’t know who to trust, and he even looks at his best friends with a certain degree of suspicion. He’ll have to figure out what’s going on fast before he–or someone else–meets a rather sticky end. I’m going to stop there before I give too much away. It’s enough to tell you that some bad stuff goes down in this book, and it wallops you in the heart before all is said and done. I, for one, wish I could dive into book four, The Silver Mask, right now so that I could see where things go from here. Sadly, that is not going to happen. Speaking of The Silver Mask, it is set to be released sometime in 2017, but I’m not sure exactly when. My guess is early fall. The fifth and final book, The Enemy of Death, will follow in 2018. For more information on The Iron Trial, The Copper Gauntlet, The Bronze Key and the rest of the Magisterium series, visit the official website. It’s got lots of interactive goodies that you may enjoy. Note: The Iron Trial is a nominee for this year’s South Carolina Children’s and Junior Book Awards. 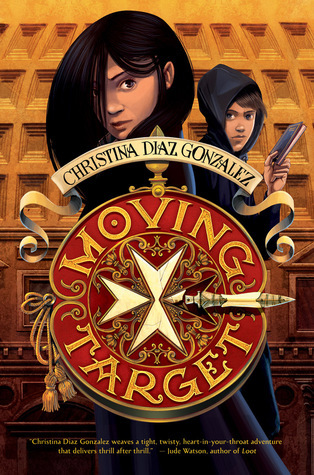 In my opinion, the entire series is a good fit for fantasy lovers in upper elementary grades and up.